“I had never seen anything like it, and I asked my parents, and they said the same thing,” the farmer told IPS. The tornado lifted fences protecting gardens in the area, whose name means “place in the middle of the water” in the Nahuatl language, and which is located on the south side of greater Mexico City, which is home to 22 million people. 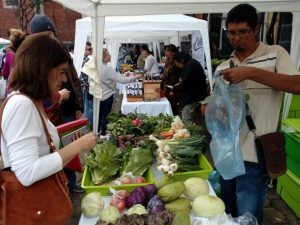 For Meléndez, who has a horticultural project with two other farmers, this is one of the manifestations of climate change, “which has devastated the area along with urbanisation.” The group uses the ancestral method of “chinampas” to grow lettuce, broccoli, radish, beets and aromatic herbs. Water shortages, an unstable climate, proliferation of pests, infrequent but more intense rainfall, hail and the effects of human activities are affecting an area that is crucial for the supply of food and for climate regulation in the Mexican capital, says a study by the international environmental organisation Earthwatch Institute. The system of chinampas, a Nahuatl word that means “the place of the fertile land of flowers”, was practiced by the native peoples long before the arrival of the Spanish conquistadors in the 15th century. The Aztec technique is based on the construction of small, rectangular areas of arable soil to grow crops in the microregion’s wetlands, with fences made of stakes of ahuejote (willow), a water-tolerant tree typical of this ecosystem. The chinampa method is used on a total of 750 hectares, where about 5,000 farmers work. The Food and Agriculture Organisation of the United Nations (FAO) classifies it as one of the Globally Important Agricultural Heritage Systems (GIAHS), for preserving agrobiodiversity, helping farmers adapt to climate change, guaranteeing food security and fighting poverty. But not only this microregion is affected by climate change. Indeed, it is difficult to find a place in Mexico that is not exposed to it. The May report “Estimates of potential yields with climate change scenarios for different agricultural crops in Mexico”, by the Ministry of Agriculture and the National Institute of Ecology and Climate Change, projected a decline in rainfall in the country. The report, focused especially on crops of corn, beans, wheat, soybeans, sorghum and barley, found that water productivity is decreasing for most crops, which means water requirements will increase in the medium term. It also found yield loss for the seven crops, especially marked in the case of corn, beans and wheat. In the southern state of Chiapas, farmers are already facing water shortages, sudden and heavy rains, floods and rising temperatures. “The areas need water, we need water for the land, renewed soil, because that is the baseline. And it’s not exclusive to Chiapas, it is happening throughout Mexico,” Consuelo González, a farmer in Chiapas who grows corn on 40 hectares of land, told IPS. González, a representative of a producers committee for her state, said there are also problems of deforestation and bad agricultural practices. Chiapas, the second-poorest state in the country, has a sown area of 1.42 million hectares and 62 crops. Among its main products are corn, pastures, coffee, sugar cane, bananas, mangoes, beans and oil palm, which account for nearly 90 percent of the state’s total production. The 12 most important crops produce 10.11 million tons. In the case of corn, the yield reaches 1.5 tons per hectare, half of the national yield of 3.2 tons, due to the size of the plots and low level of mechanisation. In 2010, the region passed the Law for Climate Change Adaptation and Mitigation in the State of Chiapas, and one year later it implemented the Climate Change Action Plan. In its nationally determined contribution (NDC), incorporated two years ago in the Paris Agreement on climate change, Mexico included strengthening the diversification of sustainable agriculture among the measures to be adopted by 2030. Among the instruments to achieve this goal, it establishes the conservation of germplasm and native species of corn and the development of agroecosystems through the incorporation of climatic criteria in agricultural programmes. In its NDCs, the country pledged to reduce its polluting emissions by 22 percent by 2030, compared with 2013 levels. That year, Mexican agricultural activity released 80.17 million tons of carbon dioxide into the atmosphere. By 2020, emissions of this potent greenhouse gas are expected to reach 111 million. By 2030, the goal is to curb agricultural and livestock emissions to 86 million tons. “Agriculture is highly dependent on local weather conditions and is expected to be very sensitive to climate change in the coming years. In particular, a warmer and drier environment could reduce agricultural production,” said Eduardo Benítez, assistant representative of Programmes at the FAO Partnership and Liaison Office in Mexico. Among other consequences of climate change, he mentioned to IPS a higher prevalence of fungi and pests, soil transformation, less availability of land and water for agriculture and alterations in agrobiodiversity. “They give something, but it’s not enough,” Meléndez said about the government’s support for helping the “chinamperos” – farmers who grow crops using the chinampa method – adapt to climate change. “It has cost us a lot of work. We carry out prevention work, such as using biological filters, to raise water in the channels to a certain level for irrigation. We try to regulate the temperature with meshes of different sizes that provide shade for the crops,” he explained. One of the problems lies in the lack of coordination among Mexican institutions, as shown by the assessment of the Government’s 2014-2018 Special Programme on Climate Change (PECC), implemented by the government to address the phenomenon. This analysis shows that the Information System of the Cross-cutting Agenda that operated between 2009 and 2012 is not working since the programme came into force in 2014, which prevents a “close follow up” of the progress of its 199 lines of action. In addition, it found that the National Climate Change System has not addressed the question of connecting programmes, actions and investments at the federal, state and municipal levels, with the PECC. González, based on her experience as a farmer, recommended silvopastoral (combining forestry and grazing) systems to maintain the plots. “There are areas that can be well preserved. We focus on soil conservation. Another solution is agroecology,” to restore soils and preserve resources, she said. FAO and the government Agency for Marketing Services and Development of Agricultural Markets (ASERCA) are working on a project of early warnings for agriculture based on agrometeorological information to monitor the climate impacts on food production and availability. The aim is for this data to be available to “policy-makers, financial and risk management institutions and mainly to producers. Thus, public policy can be oriented in actions such as the promotion and use of crop insurance or the activation of contingency funds,” said Benítez. The post Climate Change Threatens Mexican Agriculture appeared first on Inter Press Service.